I feel like I see more and more nonfiction graphic novels every year. It can be a great format for anything that could use a visual as well as a written explanation. And that, for me, means science. Today, I'll be reviewing two very different graphic novels meant to explain scientific subjects to readers with little or no background. This was quite an unusual book by me. Cunningham uses the graphic novel format and science to refute some sadly common areas of severe misinformation. 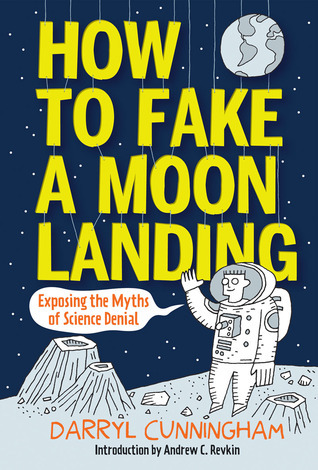 There's the moon landing hoax stuff that the title mentions, plus quite a few other things, including chiropractic, immunizations, evolution, and even fracking. I greatly appreciated the fracking article, because I felt like it did a good job of explaining exactly what the process is as well as any concerns about it. I hadn't known much at all about fracking beforehand. Now, I'm pretty up to date with most of the other topics here, so I can say that Cunningham has done his research and does a good job of presenting the facts clearly and succinctly. I'm not crazy about the art style, but I like the idea of doing this sort of book as a graphic novel. Let's face it, the people who really need to see this are slightly more likely to pick this up than another, similar book. You can get more and more in depth information on most of these subjects by reading conventional books and articles, but Cunningham's explanations are very clear, so I would recommend this as a good starting place for scientific debunking. Imagine that you're traveling at the speed of light from a distant star, with Albert Einstein as your guide. And along the way, he's going to explain the universe and how it works as completely and clearly as he can. It's a very (very) odd premise, and yet it works. 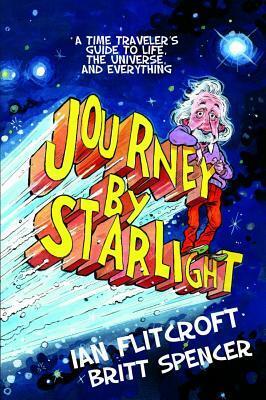 The whole thing is based off of Flitcroft's blog, also called <a href=http://journeybystarlight.blogspot.com/>Journey by Starlight</a>. I've since read a few entries from the blog, and I think the graphic novel version stays quite true to the blog entries, and adds quite a bit of context with the visuals. But this is not light reading. It may be "only" a 200 page graphic novel, but I can't remember ever working so hard for 200 pages in my life. The panels are, by necessity, full of text, which is often quite complicated text. But it's also quite clear. I understood this way better than I did when my high school physics teacher was trying to teach me. At least while I was reading it, I was able to follow Flitcroft's explanation, even if I had to read some panels very slowly or more than once before it clicked. Will it stick with me? I certainly hope so. I wouldn't have read this book if I didn't want to learn. Both How to Fake a Moon Landing and Journey by Starlight were originally reviewed at Goodreads.